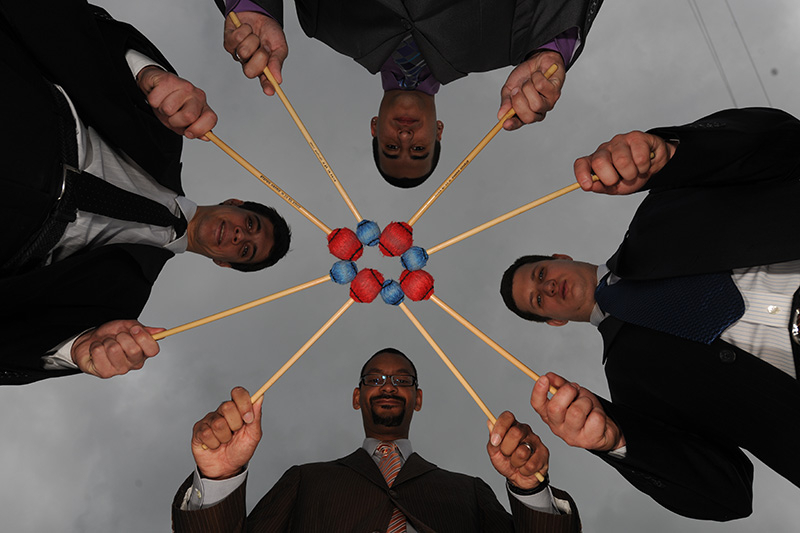 It could be said that Jason Marsalis was born to a family of innovators. It could also be said he was born into the first family of Jazz. His father, Ellis Marsalis, is a renowned pianist, Jazz educator, and patriach of a musical dynasty that includes four independently minded sons: trumpeter and Pulitzer Prize Winner Wynton Marsalis, Delfeayo Marsalis going his own way on the trombone, and youngest brother, Jason Marsalis, extending the horizons on the drums. Ellis and Dolores began to cultivate Jason's interest in music at age three with the purchase of a toy set of drums. By age six, not only had Jason gotten his first real drum set, but he was also taking lesosns from the legendary New Orleans drummer James Black. At age seven he was sitting in with his father's Jazz group as well as playing with his trombonist brother Delfeayo. Jason was progressing so rapidly as a dummer that in 1984 his father started using him consistently on engagements. In 2000 Marsalis started to play the vibraphone on gigs. This evolved into yet another chapter in Marsalis' career as he recorded on the vibes with clarinetist Tim Laughlin and drummer Shannon Powell while starting to lead his own band on vibes. 2013 was a monumental year in which Marsalis released his next recording as a leader on vibes entitled "In A World of Mallets." With each passing year Jason Marsalis continues to grow and develop as both a composer and perfomrer. With a fire in his heart and passion for the music his will to swing has never been more resolute. The maturity and the command he possesses over his music is clearly evident to those who have heard or seen him.